Looking through the TECHknitting list of posts, I've found some which were finished but never posted. Here's one on smocking. First, a sweater too wide across the top of the body (actually, this is a very common problem for women, because the bust typically requires a larger width of fabric than the overbust area). Adding bust-shaping is one solution, but adding smocking above the bust requires less pattern-alteration. A second example: a sweater too wide in the waist. (As with the first example, this common problem in women's sweaters caused by the necessity to fit the bust, which can be significantly wider than the waist.) Adding waist shaping would have solved this problem in the first place, but smocking is a simple way to solve the problem, because it can be added to a pattern which has no waist shaping, without much pattern-alteration. This post is about a kind of smocking which is done using a threaded blunt-tipped sewing needle, after all the knitting is done--it's called afterthought smocking, and it is a combination of knitting and sewing. As the below illustration shows, the yarn inserted by the sewing needle is pretty-near invisible: I used purple for the sewing yarn, and even though this is purple-on-white, the purple yarn shows only at very sides the pinch-pleat. If the pleating yarn had been the same color as the underlying fabric, it would be completely invisible. Another invisible aspect is that the pleats are formed with no outward clue as to how they were made--no yarn travels over the top of the pleats, leaving their formation quite mysterious. For both these reasons, I call this trick "invisible afterthought smocking." When smocking is worked on woven fabric, the fabric must first be painstakingly pleated. The smocking then hold the pleats in place. As knitters, we have the privilege of creating our own fabric, and therefore can make a "pre-pleated" fabric by working ribs: as you see in the above illustration, the ribs form the basis of the pleats. Stated otherwise, smocking in knitting is worked on knitted ribs. The sewing acts to pinch the ribs together in an alternating high-low pattern, forming the "pinch-pleats" characteristic of smocking. If you are planning a garment for smocking, working every fourth column in knit on a purl (reverse stockinette) background is a good standard of spacing. This type of ribbing, called 1/3, is shown above. If you have a too-wide item you'd like to tighten, it is possible to re-work (convert into ribbing) an already-finished reverse stockinette fabric into 1/3 ribs--here is a link to a post about re-working stockinette scarves into ribbing, and the idea is identical with sweaters (the fabric shown above was converted from a reverse stockinette fabric---> ribbing in this manner). ---> reverse stockinette, making three times as much work. However, even at three times the work, converting is still a whole lot less work than knitting a whole new garment. Further, if the item is a sweater, the area of actual smocking need not be very wide--the effects of smocking reach down considerably below (and, for waist-shaping, also reach above) where the actual smocking starts. Once you have your ribbed fabric, the work is quite simple. Smocked pleats are usually made in sets of two at a time, a high pleat followed by a low pleat as shown on the illustrations. As you can see, the stockinette ribs are colored pink/red. There are three columns of purl between the ribs. Each pair of red stitches represents the pinched end-points of a smocked pleat, and these pleat-pinches are joined by a loop of yarn worked through the fabric, which draws them together. In other words, the pinch-pleats are formed over the four red stitches and the columns are pinched alternately, giving the unique smocked look. 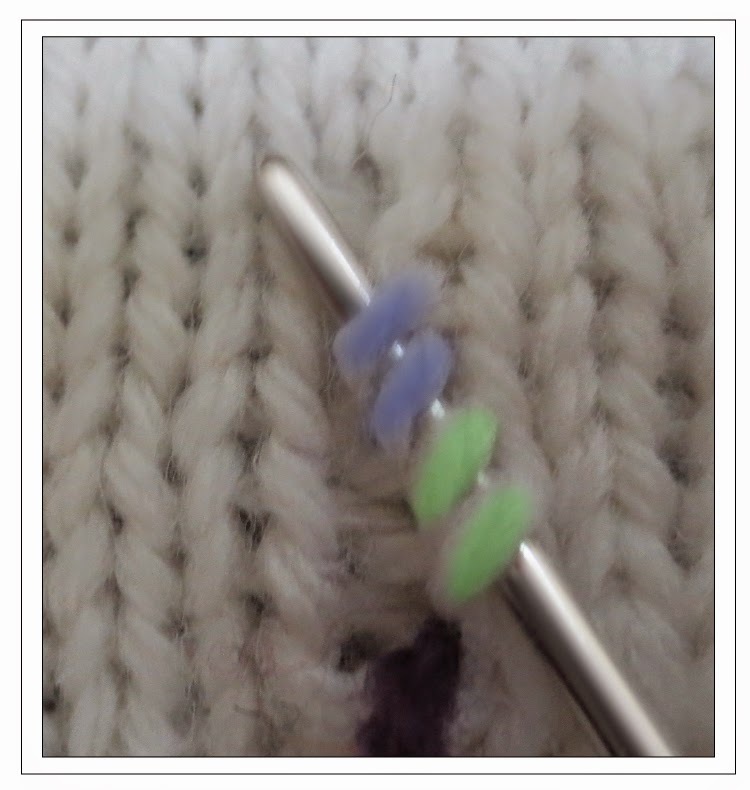 The sewing needle is used to put the smocking yarn into the fabric (each pleat-pinch is shown a different color). 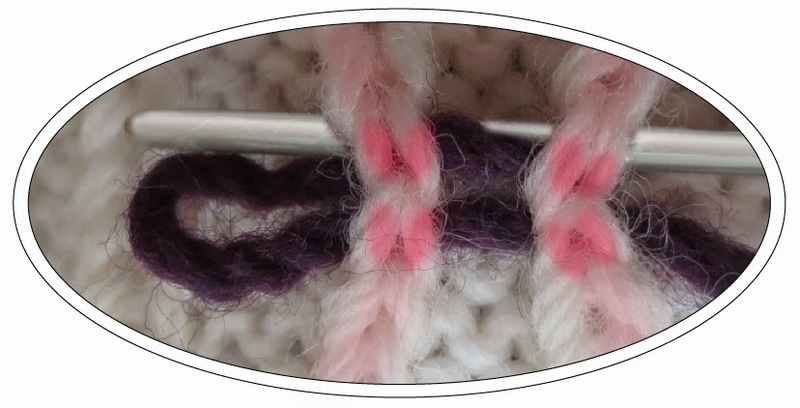 Once the loop is threaded into the fabric, it is tightened to draw the four red stitches together. Note that you actually tighten each loop as you make it: the schematic shows the loops untightened just so you can see what's going on. Specifically, these pleats are 4 stitches apart, the pinch-pleat takes two stitches, so each repeat is 6 stitches long (ie: high). However, you can make your own pleats longer or shorter, the only important thing is consistency. This diagram shows one set of high-low pleats. To add a second set, use the same spacing between sets of pleats as within a set of pleats. 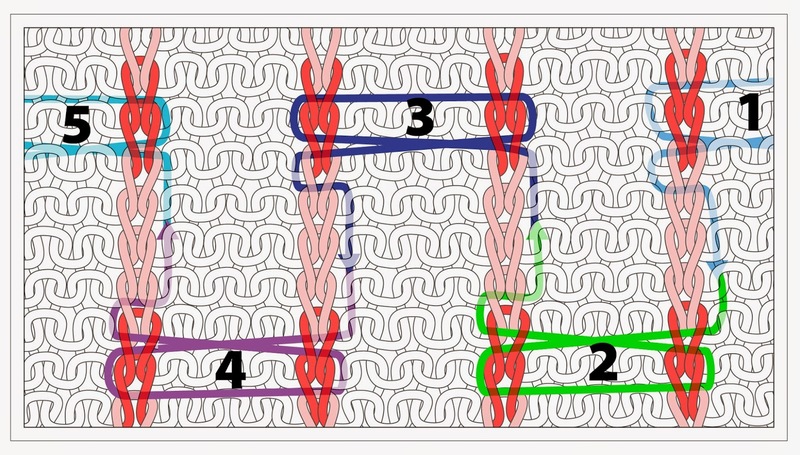 The above diagram shows the path of the smocking-yarn as seen from the front. However, the yarn travels from pleat-pinch to pleat-pinch (in our example, from pleat-pinch 2 to pleat-pinch 3) through the fabric back. When the fabric is flipped to the back, the stitch columns are reversed. Specifically, the rib on which the smocking is performed shows as a purl column while the three intervening reverse stockinette columns now show as knit columns. 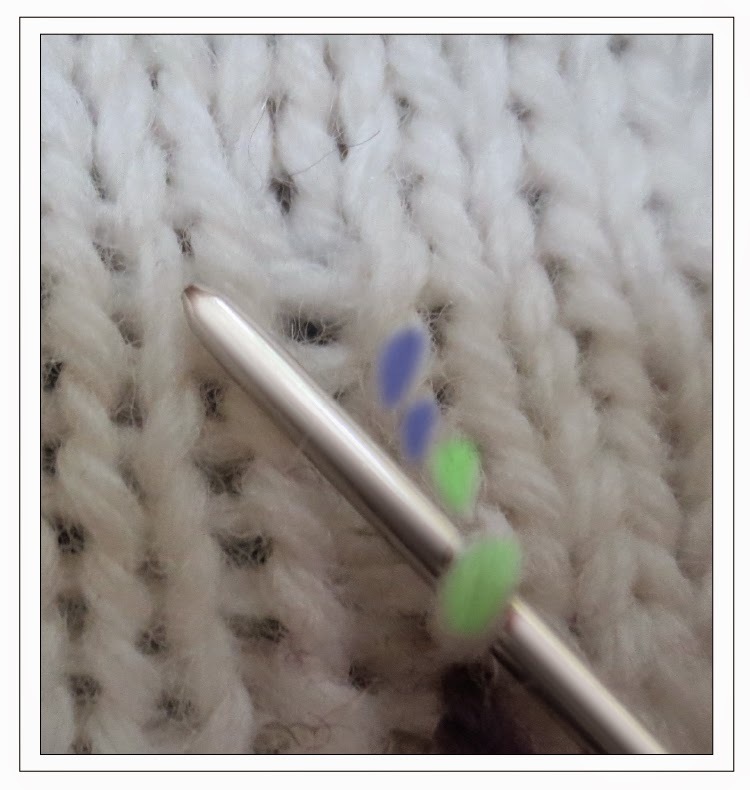 The below illustrations shows the path of the needle as it travels from pinch-pleat 2 (green) to pinch pleat 3 (blue), along the back face of the fabric. The stitches are colorized in accordance with the arrows on the above chart. As shown, the needles travels in the half-stitch bordering the purl column. Showing the position of the sewing needle just before drawing the pleating yarn through to travel from pinch-pleat 2 to 3. Secured into this half-column, the traveling yarn will not show from the front. The final illustration, below, is a closeup of the path of the needle as it creates the pinch-pleat. As you see, the pleating yarn goes in and out THROUGH THE SIDES of the pleat-stitches (highlighted in red), NOT over the top. It is this path--not over the top--which distinguishes this form of smocking from any other. Further, it is this through-the-sides maneuver which keeps the pleating yarn invisible. In fact, when your pleating yarn is the same color as the background yarn, the pleating yarn does not show at the pleats on the front nor as it travels on the back, making this a truly "invisible" form of afterthought smocking. So invisible, in fact, that it is quite mysterious--suitable for mystifying your eagle-eyed knitting friends. 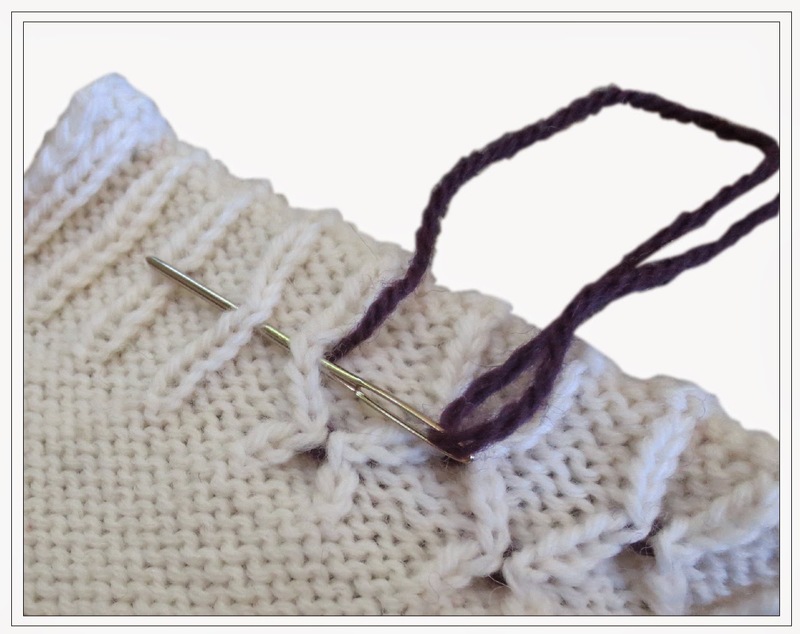 One last thing: Not only can you smock on a 1/3 ribbing as shown in this post, but it is also possible to smock on any 1/X ribbing, such as 1/2 (k1, p2) , 1/1 (k1, p1), etc. The important thing is a single row of knit rib on a background of reverse stockinette. * A third example of where afterthought smocking is useful: 1/1 ribbing is fairly common, and commonly stretches out. Stretched-out 1/1 ribbing on a sweater- or mitten-cuff or on a hat brim can be tightened the back into usefulness via this trick. The actual pleating is done the same way, with one difference: when pleating 1/1 ribbing, best to use a thinner yarn--a color-matched sock yarn, perhaps--or the amount of pleating yarn might make the fabric stiff. This is a TECHknitting blog post on invisible afterthought smocking, which is about smocking handknits, also know as smocking knitting or smocking knits. This trick is an invisible replacement for the smocking stitch on knits. Thanks for being a TECHknitter reader!